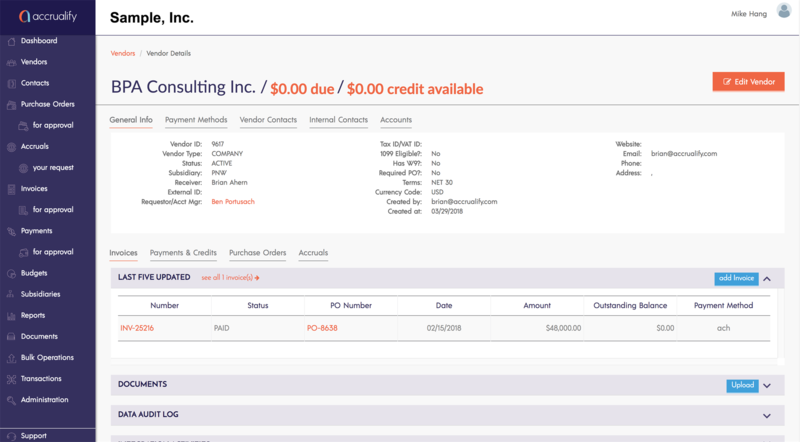 You can now see all documents in the Accrualify platform in one screen. Search by document name or transaction ID, including documents that have been deleted from the parent. 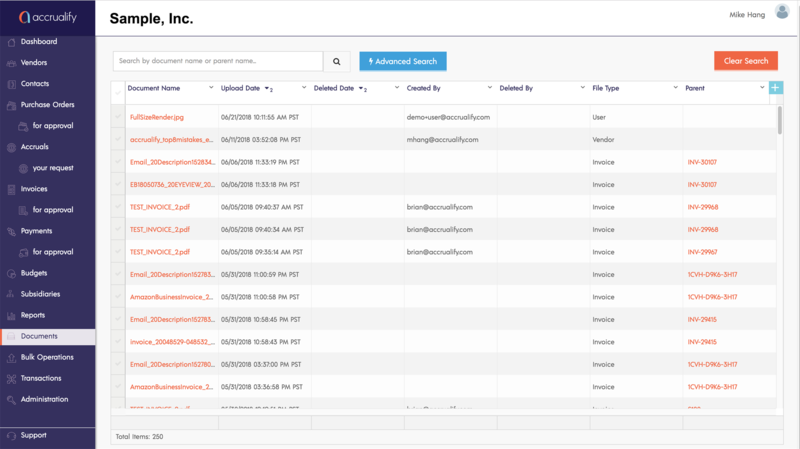 We've completely redesigned the vendor detail screens to provide more relevant information and better workflows. You can now see total amount due to that vendor, see all details exposed via tabs, and have the last five transactions associated to that vendor right up front. 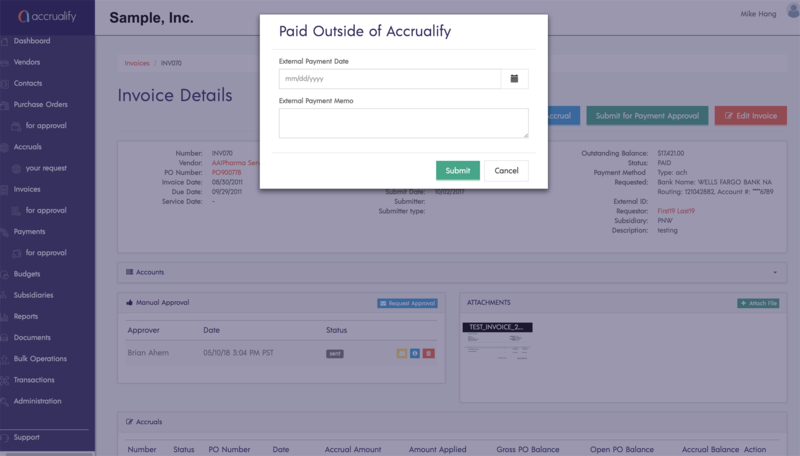 To help you better manage your invoice payment details, we've now added a "Paid Outside of Accrualify" option. 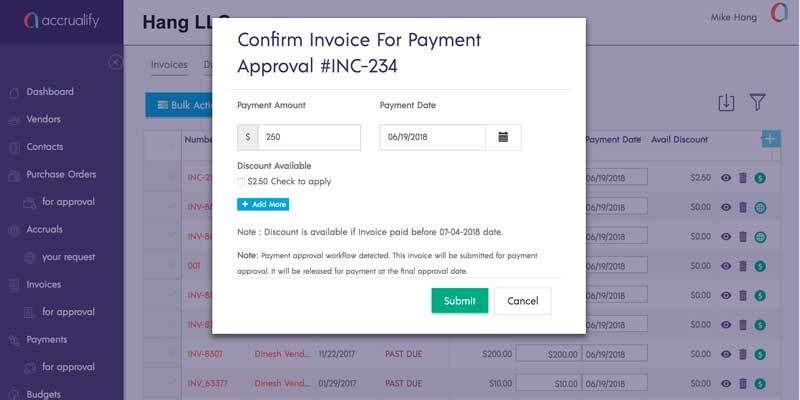 To mark an invoice as paid outside of the system, simply go to the invoice detail page, click on the "Paid Outside" button at the top right, and enter the payment details in the modal. Accrualify now helps you manage your discounted payments! Based on agreed upon terms set by you and your vendors, Accrualify will notify you when discounts are available for early payments, helping your company to save money and better manage spend. Added bulk delete option to budgets, COA, locations, and business units. Easier to understand audit log. Warning modal now appears before workflow steps are deleted. Removed Closed and Paid invoices from the AP aging reports. All grid views now have selected item totals at the bottom of the grid for running totals. General performance, caching, and appearance updates.